Ohhhhh am I in love! 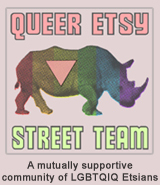 I was fascinated today when I stopped by WaterWaif's shop on Etsy and I have to share! I've been in WaterWaif's shop a number of times in the past. She makes beautiful jewelry with lots of shimmer and shine and delicate accents. But when I went by today, it was like a whole new shop! The banner at the top of the shop has a vibrant depiction of an ocean shore and she now has items on feature that match! They match so well that I almost didn't want to scroll down the page because that first look was so enchanting that it was hard to take my eyes off of. 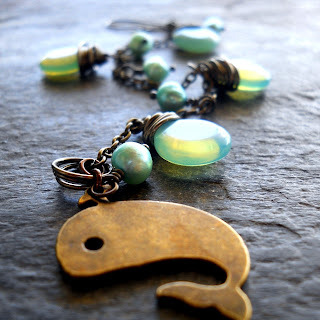 Waterwaif states that she finds immense strength and inspiration from the ocean and its inhabitants and this is apparent in her beautiful work so be sure to stop by and take a look! YOU CAN CLICK ON THE PICTURE ABOVE TO VISIT WATERWAIF's SHOP ON ETSY AND TAKE A LOOK AROUND OR, IF YOU PREFER, CLICK RIGHT HERE. You might also enjoy waterwaif's blog or visiting her on Twitter! Thank you so much for such a wonderful feature! That necklace is just gorgeous! And so beautifully photographed! I'm a great admirer of her work. Her sense of style, color, proportion, imagination and the fine workmanship of her jewelry makes it stand out. I'm proud to wear some of her jewelry. That bracelet is beyond beautiful.